Yes, yes, and yes (one day). 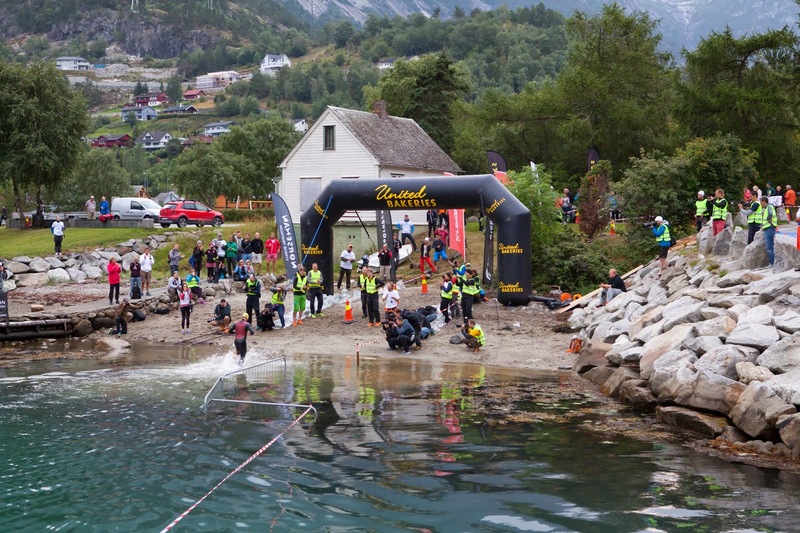 I’m feeling kind of lost after Norseman and wondering “what’s the next big thing,” even though I have another really awesome race coming up in just a few weeks. Instead of focusing on that, I’m making myself insane driving to work singing show tunes and crying in the car and relating way too much to Evita/Madonna (so what happens now? Where am I going to?). I promise I’m not a crazy person. 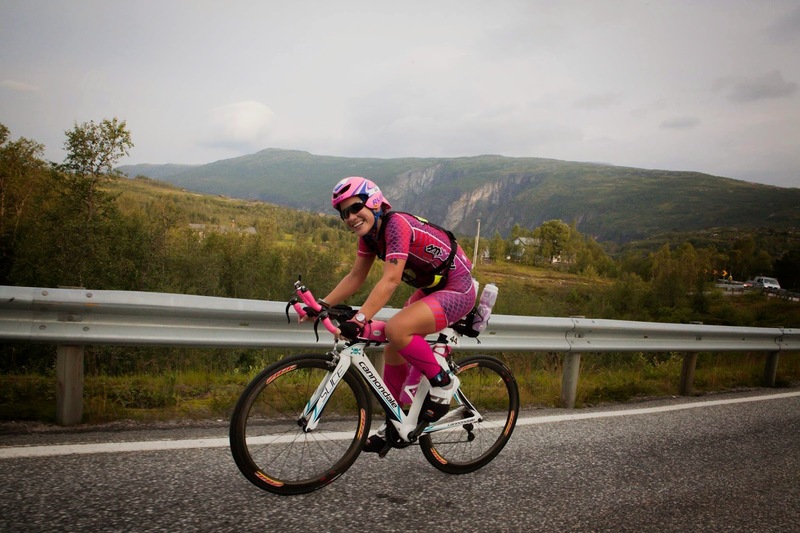 Until the moment that I entered the Norseman contest, my Big Goal was to race “one day” at the 70.3 World Championships. As an iron superfan, I can’t think of anything cooler than participating on the same course in a championship race with all of the top pros and age group athletes. Last year when Dawn raced the 70.3 WC, she even got Andy Potts to record a message telling me that he expected to see me at the race “next year.” HUGE, and at the time, unfathomable. I knew the work it would take. I didn't expect it to happen overnight. Andy Potts and Dawn at the race in Vegas last year. Then it did. It still feels ridiculous to say that I get to race at the 70.3 World Championships in Canada next month. But it happened right in the middle of my training for Norseman. I’ve never been so focused on anything in my life. 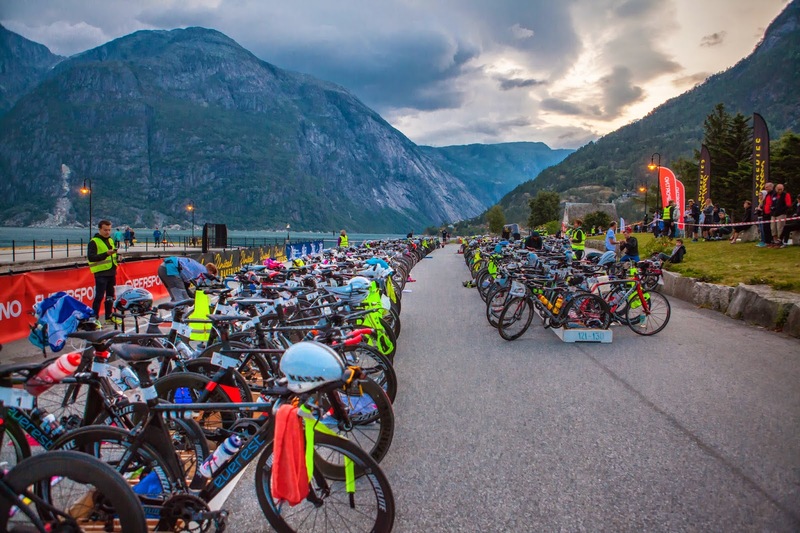 The enormity of Norseman, the impossible dream come true, made it difficult to think about anything else, including the WC race, which has been a more reasonable dream goal for a couple of years now. But then Norseman came and went. Now that it’s over, I’m feeling scattered. And everything is “kind of muted” and “absurd.” How do I come back to real life after that? The best answer came from my friend Rene, who just raced Age Group Nationals. I messaged her to ask, “how do you handle going to a championship race where you know everyone’s as good as or better than you and not freak out, OMG, I’m freaking out right nowwww! !” Her calm and reassuring answer was, this is normal. You’re right in the middle of the post-race letdown. And you’re also smack in the middle of pre-race nerves. Of course your emotions are everywhere. Rene is the smartest woman alive. Thinking about what she said helps me to put some things in perspective. I’m in the middle of awesome things happening in a short period of time. I haven’t had a lot of time to think about what’s next. The future is full of possibilities that I hadn’t even considered 6 months ago (did you know that there’s a race where you swim 10 miles, island to island, running across each one? Did you know there’s a 6-day self-supported footrace across the Sahara that regular people can enter?). With this bigger view of the world comes some risk and uncertainty. So what happens now? Where am I going to? What’s the Next Big Thing? I’ll do my best to embrace and enjoy this journey instead of freaking out. In the meantime, I’ll start to focus on Canada and remind myself that this is a dream come true. Less than three weeks! After nearly 3 weeks, my heart and brain are still here on this mountain. 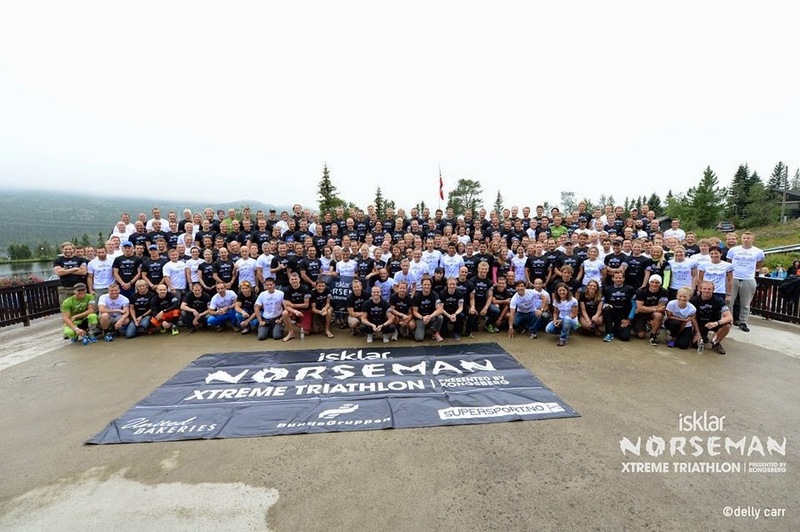 I’m writing this race report on a plane from Oslo to Newark - this flight across the world will take less time than I spent on my bike during the Norseman Xtreme Triathlon. I’ll let that sink in for a second before I describe my race day in more detail than anyone might want. The mandatory pre-race meeting was held the day before the race in what I think was a high school gym. All of the athletes and their crews shuffled into a completely dark room that was lit only by the projector behind a stage with a single microphone stand. My crew (Mom, Dad, and Robert) and I sat down on the floor and without any announcement, the video from last year’s race began to play. To watch this video on a big screen in the dark in surround sound with the 260 athletes and their crew that were about to do the race - to say it was intense is an understatement. After that came a briefing that lasted only 45 minutes before they held Q&A sessions in 6 languages around the room. We were told that of the 310 people who were entered in the race, 260 competitors from 25 countries had arrived to start, including 43 women. It’s standard to get little sleep the night before and to get up early on the morning of an ironman. This race was no exception: I think I slept maybe 1 hour total. We had packed up the car the night before. All of our luggage plus my bike needed to be ready to go in the morning because for this point-to-point race, we would not be returning to Kinsarvik afterwards. 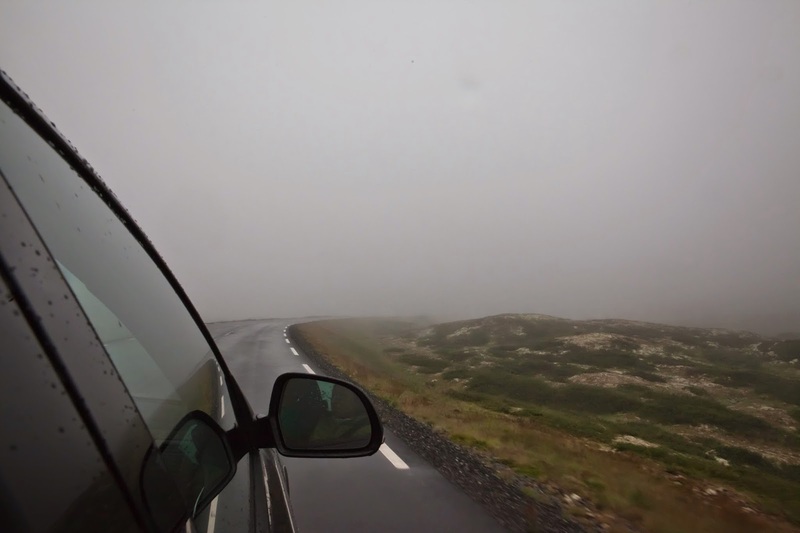 We woke up at 1:30 am and began our drive to Eidfjord at 2:15. 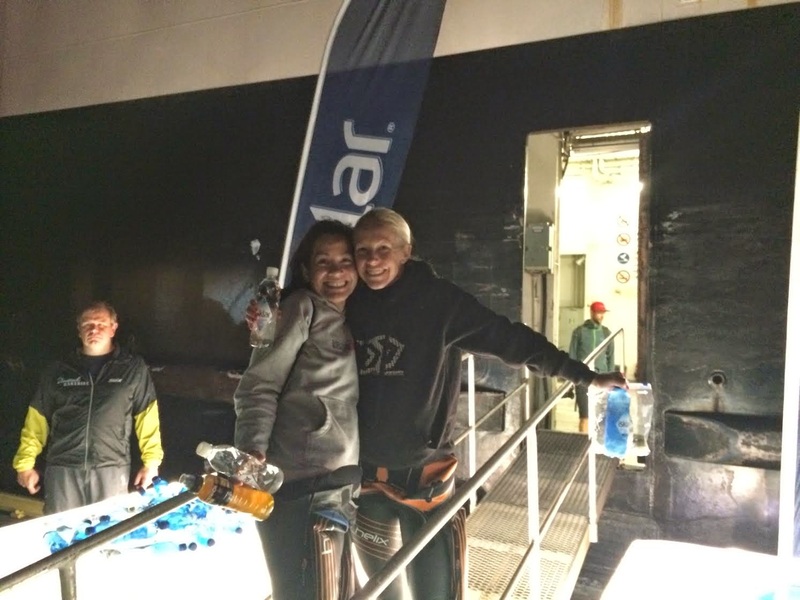 Athlete check-in was at 3 am, then you had to be on the ferry by 3:45 before it took off at 4 to drop us in the fjord for the 5 am swim start. One cool thing about this race is that you can have a crew member inside the transition to help you with everything. As we set up, Robert and I asked to borrow a bike pump from some guys next to us - it turns out that they were from Hampton Roads, Virginia, and I chatted their ears off about how my company has an office there. It was fun to talk to some Americans; there weren’t very many of them at this race. I was happy to find Penny, my new BFF, outside of the transition area. Kissed my family goodbye, Robert snapped a couple of photos, and Penny and I stepped up onto the ferry. Penny led the way and as we walked in, we saw all the guys in their wetsuits, lining the walls of the cold metal area where cars would usually go, looking intense. It looked exactly like a scene from the video. Then Penny turned to me and said, “Yeah, forget this, we’re going upstairs and stay warm,” and we went up to the top floor of the ferry; it was warm and filled with soft chairs and tables where we could comfortably sit for the 1-hour ride to the middle of the fjord. We immediately ran into another girl, Mel, who Penny had met earlier in the week. Surrounded by intense looking guys who were either listening to iPods, sleeping, or staring into space, the three of us chatted and giggled our way to the swim start. At one point I did get a little teary and told Penny that I was so glad to have met her; I have never raced alone without my friends and I was really happy to be racing with a friend. She hugged me and we giggled some more and I felt so at ease. When we felt the motor stop, we struggled into the top half of our wetsuits and helped zip each other up. The three of us wandered downstairs and I got ready to live the scene from the video - how cool would this be? When we got downstairs, the back of the ferry was open and the wind was whipping around as all the men were lined up to jump off the back. We saw another girl, Katarina, and the four of us stood around laughing as we pulled on our neoprene caps and then our yellow Norseman swim caps. We joked about how different the experience was from what the videos portray - instead of standing silently and looking dramatic, nervous, or terrified, the four of us grabbed a photographer and asked her to take our picture, danced around singing the song “Happy.” The entire situation was so different than I’d expected that it made me laugh uncontrollably. Mel, me, Katarina, Penny. Photo by Camilla Hylleberg. Penny and I waited for the majority of the men to jump off the ferry so that nobody would jump on top of us and we could spend as little time as possible in the cold water before the race. As we approached the edge, we saw a photographer in the water below. Penny grabbed my hand, and the photographer was like, “Yes, let me get this!” So we waited, posed, counted down from three, and jumped off the ferry hand-in-hand, laughing. And then resurfaced, laughing, goggles intact. Then we took our time swimming towards the swim start, which was marked by a line of kayaks about 400 meters away. We’d been advised to swim close to the shore because then we’d be less affected by the tide that we’d be swimming against. So Penny and I made our way to the end of the line of kayaks. We were almost to the group of swimmers lined up there when the ferry’s horn went off, signaling the start of the swim. We wished each other good luck, pressed the start buttons on our (matching) watches, and started to swim. Because we got a late start, I knew I’d have to swim my way through the pack. My instructions were to go “balls out” for the first 20 minutes and then to settle into a rhythm while swimming aggressively. I swam through one group of swimmers and then through another group. Each time I did this, I looked forward to see where the next pack was that I’d have to reach. It was fun trying to bridge each gap. I knew I was swimming faster than most of the people around me, but I didn’t know how well I was doing time-wise. My perceived rate of exertion was way off. I just focused on catching the next group. About halfway through the swim, I felt my hair fluffing around on my forehead - my prized yellow Norseman cap was coming off! I stopped for a moment to adjust it, and when I did, I felt a strong cramp in my left hamstring. Oh Crap. Started swimming again and felt the hammy on every kick. Began to worry about how the day would go - if I was already cramping, what would happen when I tried to climb the first hill on my bike? I decided it was really important to find some fast feet and get on them so that I could conserve energy and save my legs. I had been swimming alongside one man for some time, and when I caught up with him again, I picked him to draft. Another faster guy came up at this moment and in his attempt to get by, he hit me hard in the face with his hand. I cursed and decided to draft him instead - he was going faster and I thought to myself, “that’s what he gets for hitting me, he can tow me to T1.” So I jumped on his feet and stayed there for the remainder of the swim. I kicked as little as possible to try to help my hamstring. My arms felt strong and powerful as I stayed in his draft, but because my breathing was even and steady, I still didn’t have any idea of my pace. I felt someone drafting off me, and was proud that someone thought I was fast enough to draft! The water was cold but not uncomfortable. I could feel the change in temperature as we swam through the parts where the glacier-fed streams fed into the fjord. It was noticeably warmer to be in the bubbles in a draft than to plow through the water myself, so it was even more important to stay on those fast feet. And just like that, the swim was over. The race director helped to pull me out of the water and I took a moment to look at my watch. It said 1:11 (although the official time was 1:12) and I screamed with excitement at having exceeded my swim goal. I would have been really happy with 1:15. I had blown away my previous PR of 1:18! I ran up the small sandy beach to T1, where Robert was waiting. Passed Tamsin who screamed excitedly and (I think) snapped a photo (she was waiting for Penny who was right behind me), and then got down to business. T1 took 4 minutes, which is WAY faster than any other ironman transition for me - I would have been happy with 8 minutes. But having my own personal crew member who knew me, my stuff, and what I needed made all the difference. Robert quickly helped me to throw on my bike jersey over my tri kit. Gloves, helmet, glasses, shoes, and warm wool socks. Everything was hot pink Smash, which earned me the nickname of “Pinky” or “The Pink Lady” from spectators for the rest of the day. Robert had turned on my Garmin and the front and rear light. We slipped on my race belt with number and mandatory reflective vest, and I was out on the bike course. My parents were standing at Bike Out, and Dad yelled at me that I was in 109th place. They had counted everyone who swam past the pier before me. I planned to keep track of my place throughout the day - I needed to be in 160th place or better by 32.5k (~20 miles) of the run to earn the right to climb to the mountaintop finish. I knew that based on previous years’ results, I’d need a 7:30 on the bike to ensure that I’d get a place on the mountain. 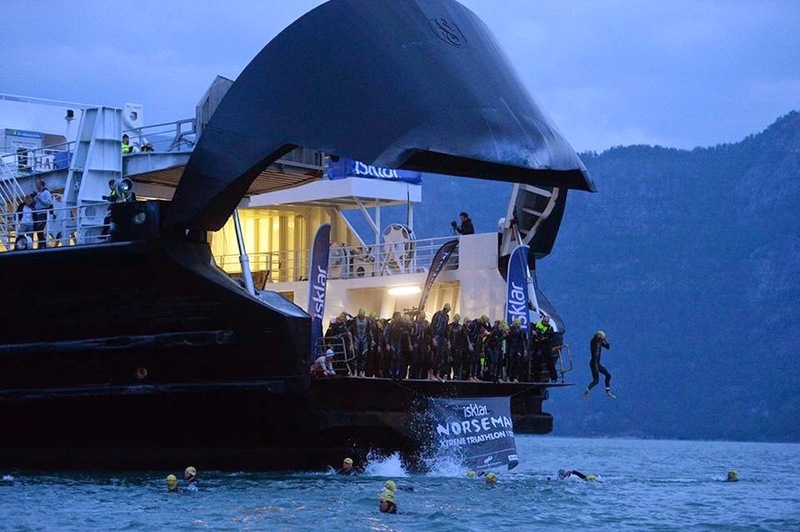 I was happy to have a little cushion with the faster-than-expected swim and T1. I’m so glad we drove the bike course before the race, because it was a huge advantage to know what was coming. 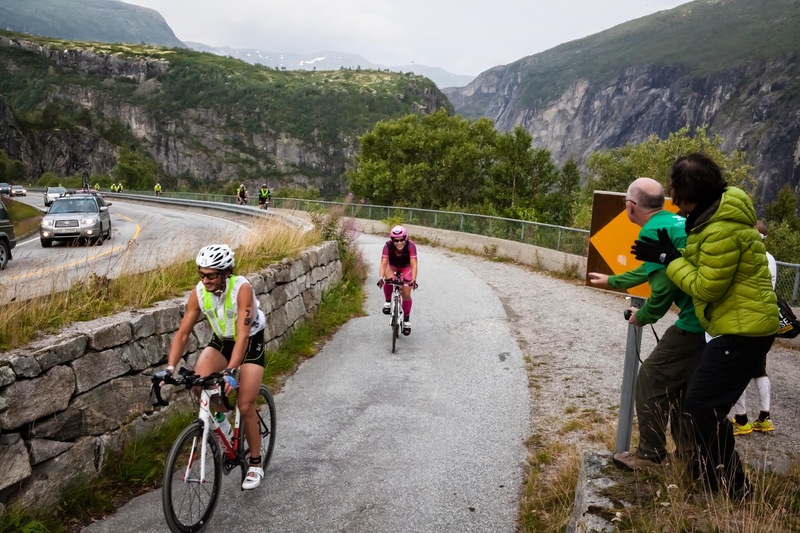 The 40k (~25 mile) steady climb out of Eidfjord was the first challenge of the course. Then we would reach a plateau with a net downhill that lasted until halfway through at 90k (56 miles). After that was a series of 3 mountain passes, followed by one final enormous steady and steep climb to Imingfjell. After that it would be 6 miles of false flat and then all downhill (some of it quite technical on poor road surfaces with unmarked switchbacks) for about 20 miles to T2. Altogether, about 10,000 feet of climbing on the bike course. My plan was to drink a bottle of Infinit and to take a salt pill every hour, with intermittent snacking on Payday bars in between. I practiced this strategy when I raced at Buffalo Springs last month, as well as in training. I instructed Mom, who was handling my drinks, that each time I stopped (every 2 hours - 4 stops altogether), both bottles of Infinit and the bottle of water that I was carrying had to be replaced, and that it was critical that she check to make sure I was drinking all of my Infinit. The Infinit provided calories, hydration, and salt that would help me to stay strong throughout the race. We planned to meet at Dyranut for the first exchange. I saw my family before that though, among an enormous group of spectators about halfway through the first section. People were cheering in various languages as bike after bike flew through a small section of road; I imagined that this is what riding in the Tour de France would feel like. Mom and Dad cheering as I approached on the climb from Eidfjord. The climb out of Eidfjord was steady, made more challenging by a strong headwind that started to pick up, but the scenery was incredible. At one point I had a steep, sheer, never-ending cliff face on one side and a rushing river on the other side, and I laughed out loud to myself that this was just like River Road in New Braunfels. We rode through low tunnels on the old road that was now traveled only by bikes and pedestrians; they were dark, lit by the flames of little gas lamps on the ground. I made it to Dyranut in 2 and a half hours. The race manual had said that it would take the average competitor 2 hours to get there. I wasn’t worried. It was windy and there were tons of racers around me. I was watching my watts, following my plan, taking it easy to save energy for the final climbs and for the run. I was happy to see my family. I stopped briefly to run into a restaurant there to pee (there were no porta potties on this entire bike course). Mom switched out my bottles and Robert helped me dress for the cold plateau ahead. I took off, feeling good. About 15 minutes later, my stomach had started to hurt. My family was supposed to leap ahead to the next point at Geilo, about 25 miles away. Instead, as they drove by, I yelled that I had to pee, and they pulled over and helped me to be as private as possible, on the ground behind the car, shielded by my Mom and a towel. I asked to take some Imodium and continued on my way. But my stomach continued to hurt and I couldn’t drink my Infinit without feeling sick. I realized the only thing that I could take in that didn’t cause pain was water. I have an alarm on my watch that goes off every 10 minutes reminding me to drink, and I ignored it several times before I realized that I had to take in calories or I’d ruin the rest of my race. At this point, I was really happy to have a support crew that could contact my coach, who was standing by even though it was the middle of the night in Texas. Robert relayed a message from Dawn that I should eat gu and bananas, so that’s what I did. I tried to eat the Paydays that I had on my bike, but everything I took in made me hurt. And I still had to pee ALL THE TIME. In retrospect, I realize that I was fueling for the hot races in Texas/Arizona/Louisiana that I’ve always done before. I usually sweat so much and I eat saltsticks and drink heavily salted Infinit because if I don’t do it, I’ll cramp on the run. This plan has always worked for me, but in the cold weather in Norway, I wasn’t sweating it out. So I felt great for the first 2.5 hours of the bike before it became a problem. Then for the next 6 hours, my body tried to figure it out while I took in hardly any nutrition (water and bananas). Then finally, in the last 2 hours of the bike, I started to feel hungry, and after I stopped to eat at the top of the final climb (chips, gummy worms, beef jerky, bananas), my stomach began to feel better. Throughout the nearly 9 hours that I spent on the bike, I stopped 7 times to pee and get aid from my family, including bananas, water, Motrin, Tums, and changes of clothes. At an average 3 minutes per stop, this really cost me, and I knew that nearly the entire field had passed me. Even though I felt like crap for more than half of the bike, I am not lying when I say I enjoyed it. 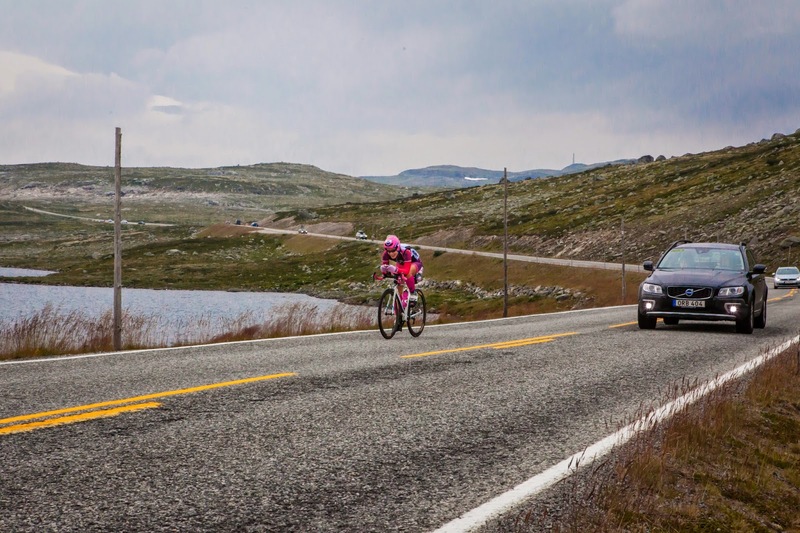 I yelled out loud to myself more than a few times “I can’t believe I’m doing Norseman!” When I had to slow for some sheep to cross the road ahead of me, I laughed and waved at them. One of my goals was to stay relentlessly positive and I’m glad to say that I did it. I know that this saved my race. It's clear why they were calling me "Pinky." The scenery was incredible. It changed so much - after the climb from Eidfjord, we reached a grassy plateau that was sparsely populated with small lakes and cabins that people use in the winter for cross-country skiing. Geilo is a bustling little town that marks a perfect halfway point. Then the three mountain passes are scenic and smell deliciously of pine, with gorgeous little houses in some sections. 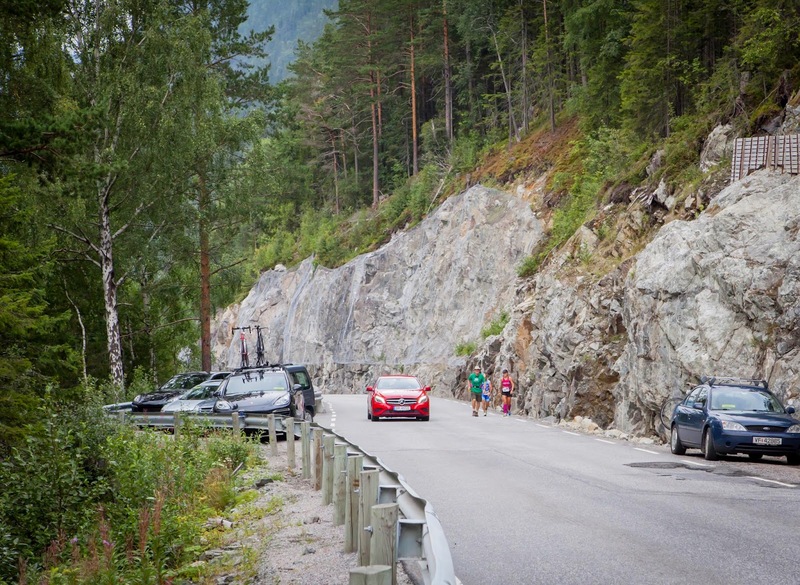 And then the final enormous climb to Imingfjell, although punishing to the body after such a long time on the bike, is beautiful with its switchbacks and green trees and moss-covered rocks. The weather changed the entire time too. 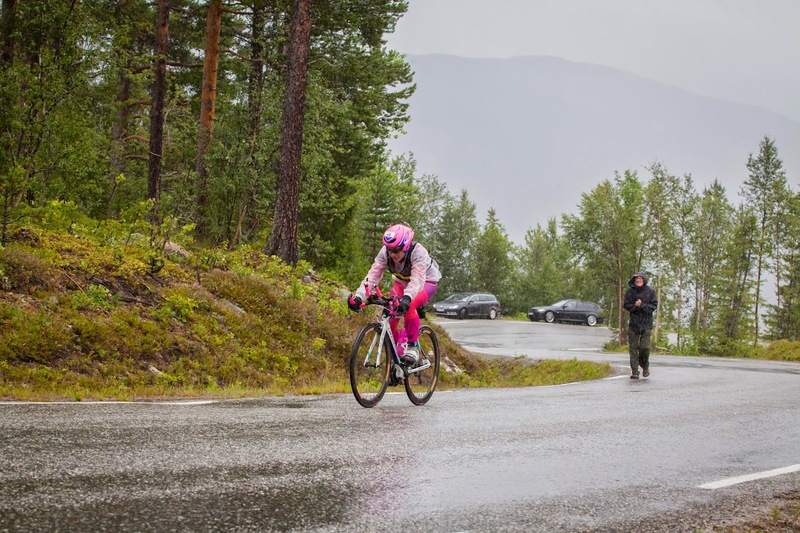 The climb from Eidfjord was almost warm, followed by brutal, cold crosswinds on the plateau, followed by chilly climbing and descending after Geilo, followed by pouring rain on the climb to Imingfjell and dense fog on the false flat that made it impossible to see further than 3 car lengths ahead of you. The final descent towards T2 was terrifying with fog, rain, sleet, and hail. The rain was really starting to come down on the final climb. Dad in the background offering relentless support. And then came the thick fog. My family met and checked on me countless times, and after they fed me at the top of the final climb (my Mom literally fed me gummy worms like I was a baby bird), they rushed to T2 to get my running stuff ready. I was left to descend by myself in the cold and rain, completely soaked even wearing my rain gear and enormous gloves borrowed from Dawn. I couldn’t feel my hands and I couldn’t see out of my sunglasses, which I had to keep on because they protected my eyes from the bouncing sleet! As I descended further into the valley, the weather started to clear up. Knowing I was definitely out of contention for reaching T2 in the first 160, I decided to at least try to get there in less than nine hours. NINE HOURS. OMG. I ended up making it there in 8 hours, 52 minutes. Robert helped me wheel my bike over to my spot, which was already all laid out for me. I changed my shorts, socks, and shoes. Grabbed my visor and my fuel belt. Ran to a porta-potty (yes!!!!). Then poked my head out and screamed at Robert that I’d forgotten my Garmin. He rushed it over to me. On my way out of transition, a woman holding a sign with a number on it (209? 212? 219? - I can’t remember) asked me what my number was and I told her “44.” Then started running. T2 was a blur. Photo by Dad. After feeling so bad on the bike, I had no idea how the run was going to go. I realized pretty quickly within the first mile that the number the woman had been holding up was my place in the race - I was in the 200s but I wasn’t in last place. OK, try to run and finish without peeing or pooping on the course. That was my goal. After about a mile, I caught and passed another runner. Then I took a gu with water and didn’t feel sick. Then I caught and passed another runner. And then I realized that this race was not over. Maybe I could run myself into a place below 200 - that would be acceptable. That became my goal. As I ran alongside the beautiful river on the course that I’d been looking forward to running for a week, I felt stronger and stronger. Took in my nutrition and felt good. Robert leaned out the window and yelled at me that Dawn had said “Don’t forget, everyone is hurting. You’re still racing. Find one more gear, dig deep. Go get it. Don’t give up.” This is what Hillary had told her when she was suffering at Ironman Texas. And I realized that of course she was right. Passing runners one by one, I could tell that they were hurting and yet I was flying. I felt like I was running downhill (Dad told me later that I wasn’t, and I just couldn’t believe him). I wondered how long I could last, but with every runner that I passed, my confidence grew and my pace stayed the same. I started to wonder if I could pick off the 50-something people that I’d need to pass to be able to climb the mountain, and I kept on running, taking in the scenery, taking strength from passing people, and enjoying the little game that I was playing. From the reactions of the other participants and the support crews as I passed them, I realized that I was doing something extraordinary. Flying on the most gorgeous run course. By the time I reached the 25k (~15 mile) checkpoint at the start of Zombie Hill, I had passed 18 people. I’d run 2:08 for the first half of the marathon - I’ve only run faster than that one time at the end of a triathlon. I was thrilled, but it wasn’t enough yet. I wondered what Zombie Hill would be like and if I’d be able to power past people there too. Dad joined me to pace me up the hill, and for the next 4+ miles, we walked and walked up the relentlessly continuous 7-10% hill. Robert and Mom leapfrogged and checked in on us from the car. Zombie Hill - Dad pacing me and another athlete up the hill. I was so tired that I couldn’t even fully extend my arm to take water from Dad when he offered it. I couldn’t eat, breathe, and walk at the same time, so I stopped every once in a while to take a few bites of banana. I began to understand why it was called Zombie Hill. Dad kept an awesome pace - he’s been training at an incline on a treadmill for hours every day this summer and it paid off! He kept telling me how proud he was, and I was too tired to respond. We walked the 4 miles at a 16-19 minute mile pace. Then we reached the checkpoint at 32.5k (20ish miles), the one that would determine if you went up the mountain or not. I had passed maybe 4 people on the hill. I turned to Dad about a half-mile before the checkpoint and said “I don’t think I’m going up the mountain today,” and he gently replied, “No, I don’t think so.” Of course he had known for an hour that it wasn’t going to happen, because he’d been informed that 160 had already made it to the checkpoint, but he hadn’t told me and I had never given up hope. We were directed towards the secondary finish line (along the beautiful road that I had run on a training run earlier in the week). I asked one of the officials if he could just tell me what my placement was. “194,” he said, “You did well. 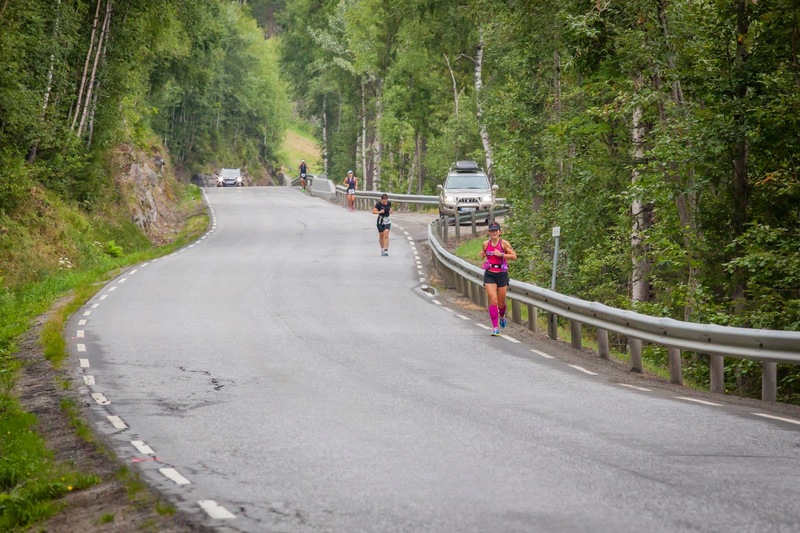 You made the time cutoff (14:30) by 20 minutes but too many people got here ahead of you.” I was happy to have moved up in position but sad to miss out on the black t-shirt and the climb to Gaustatoppen. I started to cry a little bit and then shook it off. As we turned the corner, I looked at my watch - 3:50 for the first ~20 miles of the marathon. The next mini-goal kicked in. “Dad, this is what’s happening now. We have less than 10k (6.2 miles) left to go and I’m getting a new ironman marathon PR today.” He had only planned to walk Zombie Hill with me - he hasn’t run in 5 years - but he looked at me excitedly and was like “OK! Let’s go!” and we took off running. My ironman marathon PR (from Ironman Texas last year) was 5:57. I realized almost immediately that I’d be able to beat that if we just walked the 10k to the finish, so I amended the goal - how about let’s try to go under 5 hours. We had to pass the finish line to do 2 out-and-back loops to finish the final 4 miles. As we ran the flats and downhills and walked the uphills, spectators and athletes alike were yelling encouragement and marveling at my pace. At this point, Dad and I were the only people out there who were running. Nearly everyone else was walking. It was an amazing feeling. As we reached the turnaround point at the end of our first loop, an official slipped an orange rubber band over my wrist. This would prove that we’d already done one loop. We ran back towards the finish line, and then I headed out for the second loop by myself (Dad called it a victory lap). It seemed to take no time at all to run this loop. I smiled and laughed and talked to the spectators and told them that I loved them. I congratulated the other runners on the course. I took my yellow rubber band from the turnaround point. On my way back with less than half a mile to the finish, I saw Mohamed Lahna, an athlete with a prosthetic leg who had done the entire race ahead of me except for these last few miles. He simply told me “Run” and I got choked up, thinking if this dude is telling me to run, I need to RUN. 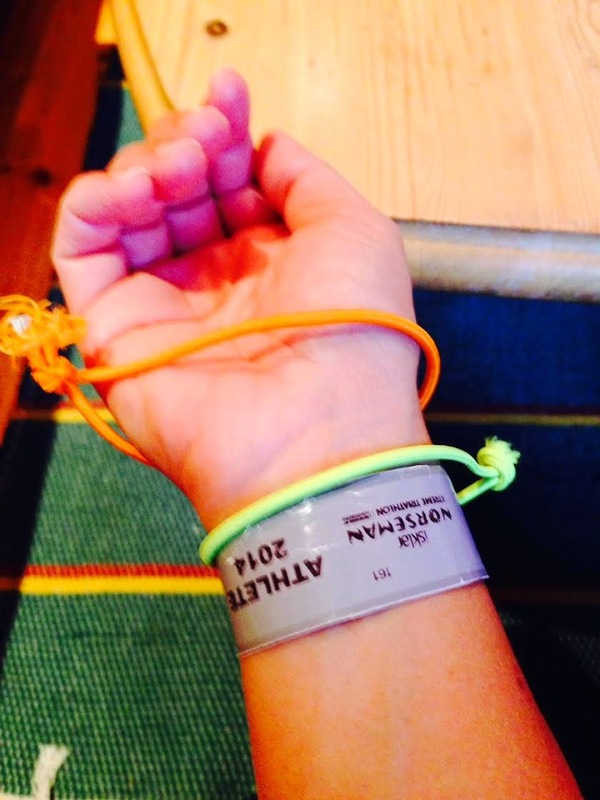 Two little bands proved that I'd completed the last two loops of the run course. I ended up with a time of 5:06 for the marathon - 51 minutes faster than my previous PR - OMG. I ran through the cheering spectators to the finish line which was marked off by some tiny cones and spray painted arrows on the floor. I almost ran right past it! No music, no finishers chute, no Mike Reilly. No thousands of screaming spectators. No catchers, no medical tent. No finish line photographer. Just a timing mat under an archway, which I crossed with so much satisfaction with my parents and Robert there to greet me. Happy finisher with awesome crew. A soft-spoken female volunteer walked over to me and whispered, “Congratulations. You’re a Norseman.” And then another volunteer asked me if l would like some soup, which was served to me in a coffee cup along with a small slice of bread. And that was it. Finish time 15:21 on one of the toughest ironman courses in the world. The following day, there was an awards ceremony followed by an official group photo of everyone in their t-shirts. I was bummed to be standing there in a white t-shirt amongst all of the folks who were proudly wearing black. Despite this, I had fun taking photos with my new friends and exchanging stories with them and the support crews that had cheered for me all day. I particularly enjoyed hearing about Penny’s ridiculous day (she's amazing; under such difficult circumstances, she ended up fighting her way to being the 160th person to pass the checkpoint). All of the participants signed this banner to mark our place in history! Days later, I’m still disappointed about not getting the full experience with the mountain climb and black t-shirt. I knew before I started that it would take a perfect day to be able to get up there to the mountaintop finish and I didn’t have one. But the experience was incredible and I’m proud of my accomplishment. I’m still incredulous over how I ran so well off a freaking nine-hour bike ride. Learning that I can keep a positive attitude when things are going wrong for SIX HOURS - well, I can’t imagine how that’s going to help me in my racing after this. The future feels big and bright and full of possibility after what I experienced and learned about myself here at Norseman. It was truly the opportunity of a lifetime. I enjoyed every minute; I think it’s the greatest race in the world, and I think everyone should rush out and sign up for next year’s lottery. I also think I’ll want to make another attempt at that Black T-Shirt one day. I’m so thankful for the support of my parents, especially my Dad who ran nearly the last 9 miles of the race with me. I’m grateful to my husband, Robert, for helping me and understanding me through all the training and through the execution of this race plan. 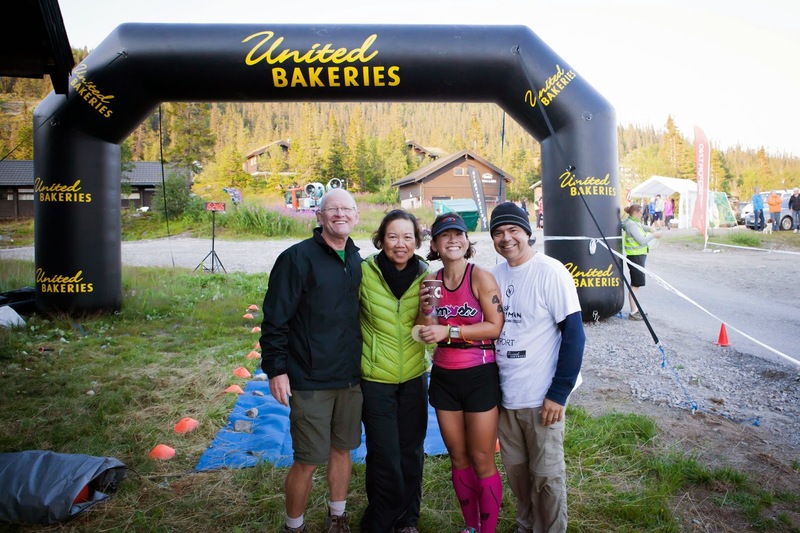 I can’t say enough about what my coach, Dawn Elder, has done for me over the 3+ months that I trained for this race - the trips to train in Arizona, the research that she did to figure out how to get me ready, the help with the mental preparation that it would take to stay strong through the race. Thank you to Chris Aarhus for all the instruction in climbing, handling, and descending on the bike - I can’t believe how much better I’ve gotten at this. Thank you to Matt and Greg and the guys at Bicycle Heaven who set me up with a perfectly dialed bike with fabulous wheels, taught us how to safely transport it to Norway and put it back together again, and provided laughs and entertainment along the way. Thank you to Justin and the folks at Promotion Physical Therapy who helped keep me healthy (both physically and mentally in the days leading up to the race). 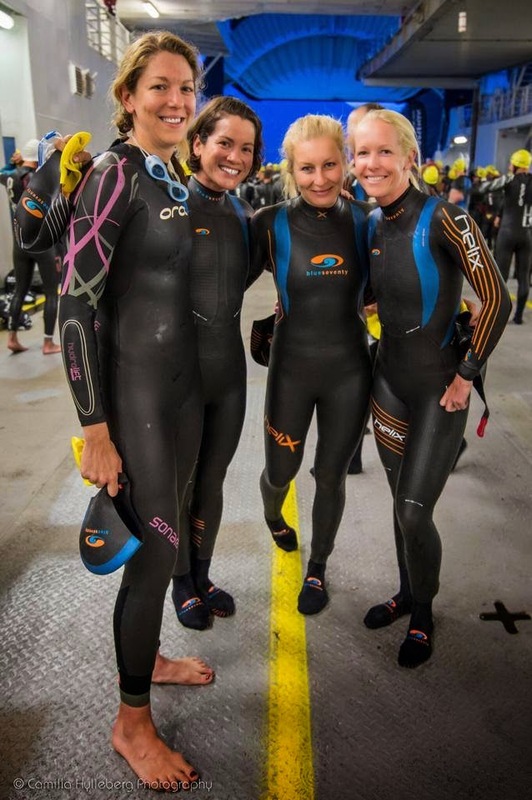 And of course, thank you to everyone who voted for me in the Facebook contest and to blueseventy for my race entry and sweet wetsuit and gear! Thank you to my friends and coworkers who encouraged me and listened to me talk about this race all summer. And finally to my amazing training buddies who were out there every weekend training with me and pushing me to exceed my own expectations - thank you, thank you, thank you. 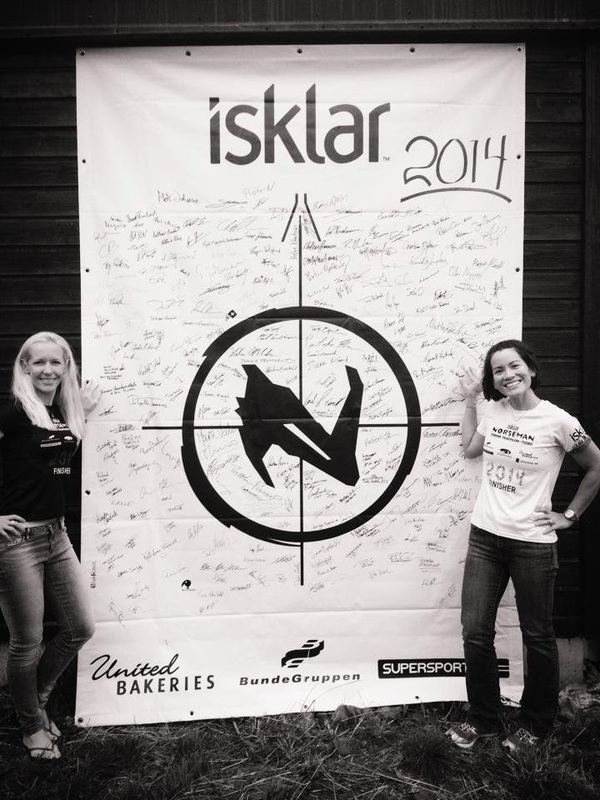 Norseman 2014, the greatest adventure of my life (so far), is in the books! *All photos by Robert Cordova unless otherwise noted.